The students are offered with Merit, First Graduate, AICTE Tution Fee Waiver, BC, MBC, and SC/ST Scholarships regularly. Apart from scholarships, various awards are also instituted. Mrs. Velumaniammal Venkatesalu Naidu Memorial Gold Medal for best outgoing student and Mrs. Saradhamani Balakrishnan Naidu Memorial Gold Medal for best outgoing girl student have been instituted by SNR Sons Charitable Trust. Sri S.N.R Chinnasamy Naidu Memorial Gold Medal - EEE Branch. Sri. 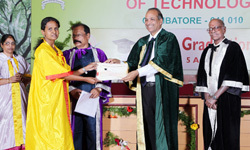 S. Selvam Memorial Gold Medal - Civil Engineering Branch. Smt. 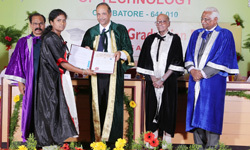 Padmavathy Ammal Memorial Gold Medal - IT Branch. 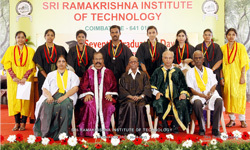 The gold Medals were awarded during the Graduation of the final year students. Copyright © 2016 srit.org All rights reserved.